A fun summer dress with stand-out chindi yoke. Pullover, cap-sleeve hand print design with hand embroidery highlighting the chindi yoke. Knee length. wash separately; dye is not fixed. add vinegar to rinse water. Hoping that will fix it. I like the dress otherwise, its simple and interesting. Be aware that the actual chest measurement for size medium is 42 inches. I have been a customer for many years and a medium was always a perfect fit for me. So I ordered two Nasreen dresses -- one in purple and one in blue. The chest measurement of these dresses is 42", which is theoretically the correct size for a 37.5 - 39" chest. That is 3-4.5" of ease. Who wears their clothing that loose? 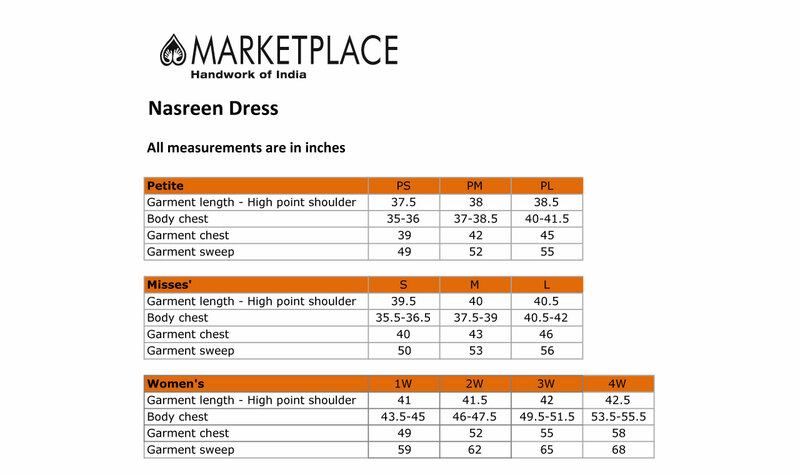 I thought Marketplace India was one of the companies I could trust to make at least cursory measurements of finished garment sizes as part of your quality control. Back they go. Very disappointed. Owner Response: Thank you for your review. According to industry standards a garment has to be about 3" more than the body measurements so it can be put on and taken off with ease. MarketPlace garments do not have zippers so they need to have more ease for wearing. This particular dress is meant to have a relaxed fit. Easy to wear, looks great. Love the hand embroidery.